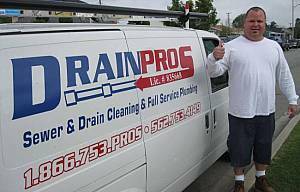 FULL SERVICE Quality Plumbing: Drain Pros serves L.A. & Orange counties. 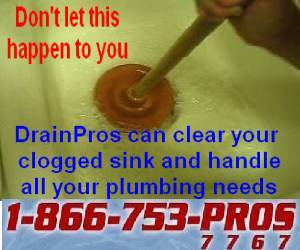 For CURRENT DISCOUNT SPECIALS, CLICK HERE. 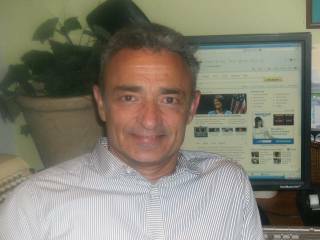 New: Choose AMECO -- the solar professionals with experience. Stop "renting" your power - OWN the energy you use every day! 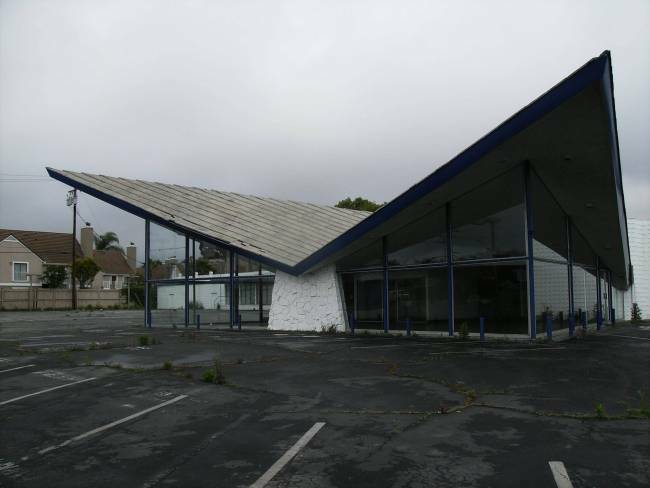 On April 26, LATimes.com reported the passing of Eldon Davis, an architect credited with helping create the California cofee shop "space age" style designs of the 1950s and 1960s (large fins, vaulted roof, angular shapes) (coverage click here. LATimes.com notes that L.A. is home to examples of this style, but in the story below, LBReport.com Community Correspondent Joe Mello, with additional reporting by Daryl Supernaw, notes that Long Beach has plenty of Googie .,,and its being reused and repurposed. 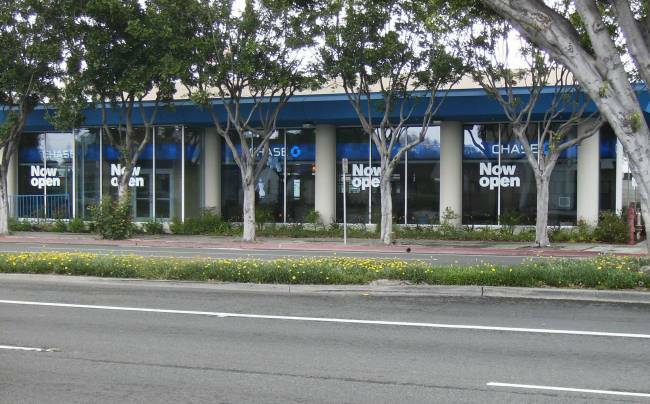 The re-purposing plan will save the large chevron shaped floor-to-ceiling glass showroom and add storefronts behind it along Lakewood Blvd and a car wash along the side facing Willow. Artwork provided by the LB Planning Dept. 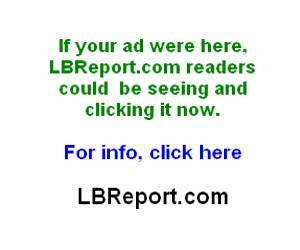 to co-author Supernaw, who says the same rendering is on a sign on the site. 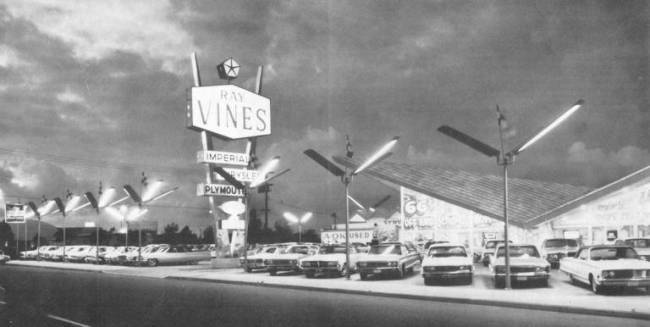 The Vines dealership as it appeared in an ad for a lot lighting company in the 1960's. The Vines dealership later became Gould Chrysler Plymouth, then a Worthington lot. In 1963 Ray Vines built a Chrysler dealership at 4201 East Willow Street at the corner of Lakewood Boulevard. It was constructed by J. W. Greig in a Mid-Century Modern mode with folded roof planes, angular plate glass windows, and soaring gables. 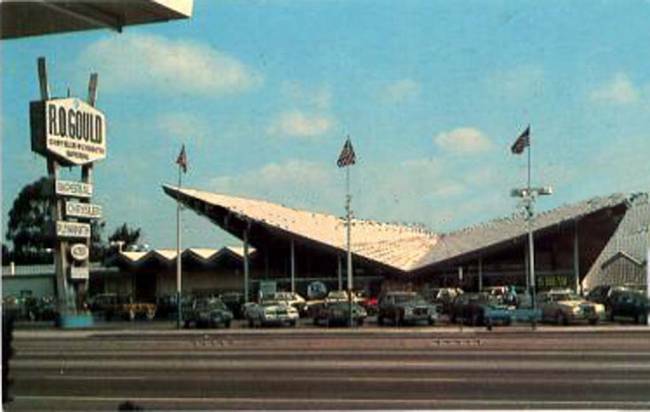 The building complemented the sixties cars with their projecting fins and exemplified a daring type of design now referred to as Googie. It is one of the few examples of this type oif structure in the city. 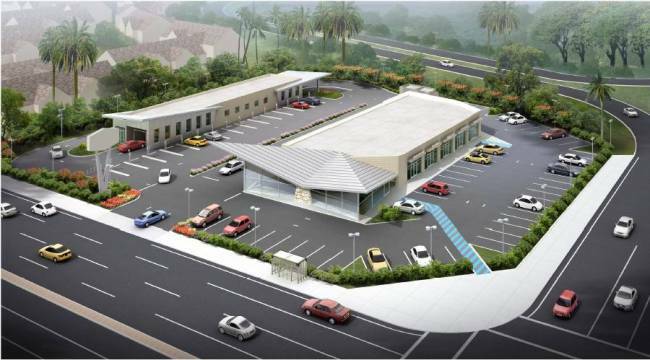 A presently proposed project would include a car wash on the west side of the site with a retail component located in the showroom building. 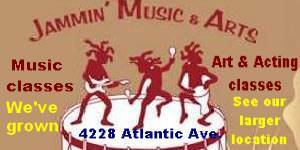 The original pole sign would also be reused. Because much of East Long Beach was developed after WWII, the area became home to considerable 1960’s Googie architecture with its large plate-glass windows, bold angles and shapes, cantilevered roof lines, and colorful roadside signs, giving it the pop-culture appeal of the Jetson’s cartoon age-of-tomorrow. Although many of Long Beach’s Googie style structures like the Elks Club dome (formerly next to the Ray Vines site on Willow) and the Java Lanes Bowling building (west of the Traffic Circle on PCH) have been demolished, some of East Long Beach’s architecturally significant buildings -- including the former Bob’s Big Boy turned-Blockbuster-turned Chase Bank on Bellflower Blvd. 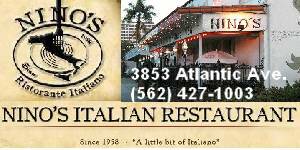 (just north of Stearns St.) have been saved with re-purposing. 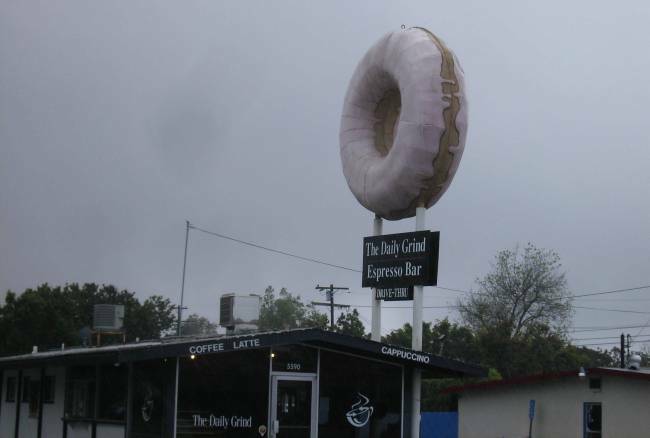 Other less notable, but still significant gems like the Daily Grind giant donut building on the Seventh Street just west of the PCH intersection and the Los Altos medical building (1777 Bellflower Blvd.) 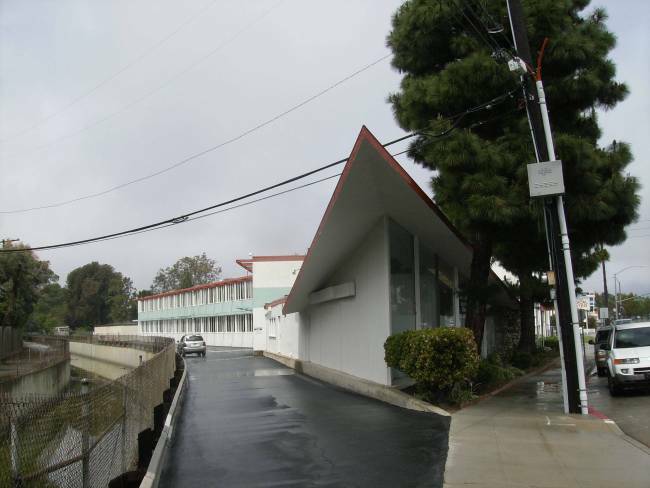 are likewise examples of Googie-style architecture having a re-purposed use in East Long Beach. . Although East Long Beach may not be what first comes to mind for some when it comes to Long Beach architectural icons, its neighborhoods are rich in period design. The Ranchos, Park Estates and Los Altos neighborhoods, as well as public spaces at Cal State Long Beach and the VA hospital, are rich in Mid-Century architecture. 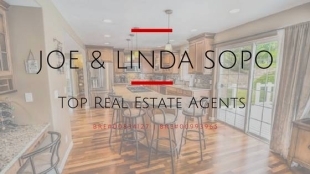 The Park Estates neighborhood features important architectural works by two mid-century architectural masters: the Alexander House by famed 1960’s architect John Lautner and the twin Moore/Hafley homes by the notable Richard Neutra. The Ranchos across from El Dorado Park are an entire neighborhood designed by Cliff May, father of the California Ranch Home style. 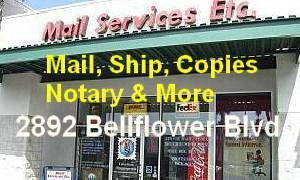 East Long Beach’s two major employers also have exceptional architecture. CSULB began as Long Beach State College with architect Edward A Killingsworth as the master planner and Edward Lovell as its landscape architect. A 1962 sculpture symposium added a world class sculpture collection to the campus landscape that features the likes of Clare Falkenstein and Andre Block. In 1994 the 178 foot high Pyramid by architects Hugh and Donald Gibbs was added to the campus. Next to the campus is the Veterans Administration and former Navy Hospital site. The original 1958 era Building 122, a 300,000 square foot hospital designed by Welton Becket & Associates, was demolished in 2004. Numerous buildings have been added over the years including the hospital’s signature eleven story white cubic Building 126. Finished in 1967, it was designed by Adrian Wilson Associates. The two newest buildings being completed are twin buildings flanking the cubic signature tower. Those buildings will house the new state of the art emergency room, blind center, an employee eating "canteen" and an event auditorium. The twin buildings wave roofs design will be duplicated on the 60’s era tower, up dating and uniting the structures with a Long Beach theme.